MARIETTA, Ga., Oct. 15, 2018—In July, the city of Creswell installed two, new TC-400 Radarsigns that were purchased with grant monies through the Oregon Department of Public Safety Standards and Training (DPSST). The portable, battery-operated signs were moved at the beginning of September to new locations within the school zones as police prep for back-to-school congestion. 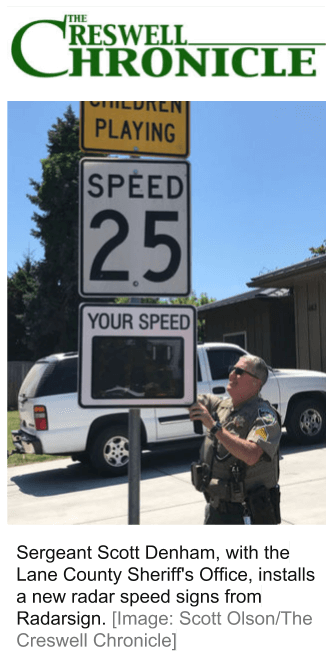 In the article “Creswell’s speed radar signs: What they do, why they’re here, how they work,” Lane County Sheriff’s Office Sergeant Scott Denham explained how these signs will be used effectively in their new location. “The signs can be set with multiple timers so that they will track school zone speeds while the yellow lights are flashing,” Denham said. The StreetSmart Traffic Data Reporting software that the city purchased along with the signs will generate more than 30 charts and graphs to help report, organize and analyze traffic data gathered in the school zone. A Creswell city planner will then incorporate that data into the City’s Transportation System Plan and the upcoming Safe Routes to School Plan. Radar speed signs are a traffic calming solution for many rapidly growing cities with increasing call loads, increasing vehicle traffic and limited police coverage leaving deputies with little time for prevention patrols or traffic enforcement. The Radarsigns can be present when officers can not, collecting data and serving as a deterrent. Radar speed signs from Radarsign are effective because they leverage a psychological concept called the feedback loop—a behavior modification process that is passive, yet effective in slowing speeding drivers. Basically, the science of a feedback loop is this: by providing people with information about their actions in real time and by giving them an opportunity to change their actions, people are likely to choose better behaviors.